Kevin Cunningham, CEO at MRP, has more than a decade of deployment experience in the Account Based Marketing space. About a year ago they acquired Prelytix, a player in the Predictive Analytics space. When I caught up with him last week via Skype we had a chance to discuss this intersection between ABM and Predictive Analytics. 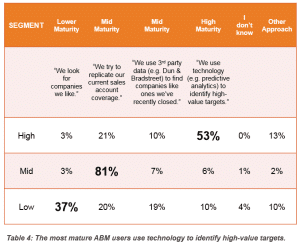 Our recent research identified that two-thirds of high-performing ABM programs use external data, and more than half leverage advanced data in the form of predictive analytics. Kevin explores this symbiotic relationship between ABM and predictive analytics. Predictive analytics is a natural progression of ABM. Marketers with a solid understanding of their target audience, invest in great content, and potentially have a scaled understanding of their vertical industry application can most quickly and successfully scale their ABM program using predictive analytics.